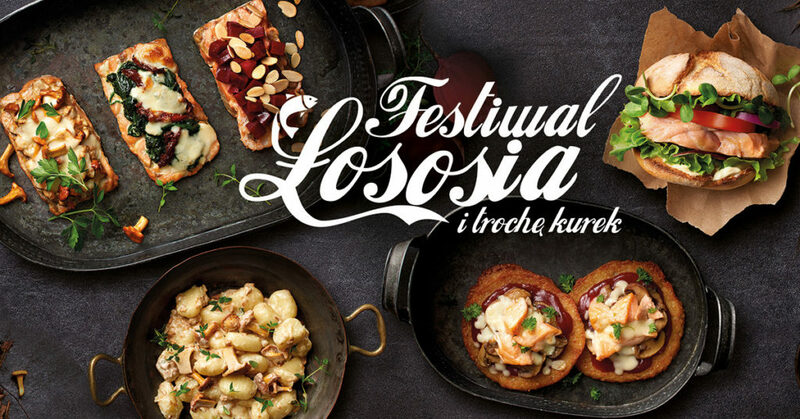 Festiwal Łososia w North Fish | North Food Polska S.A.
On 28th August, “Salmon Festival” began in North Fish restaurants. The customers will enjoy the flavours of early autumn, dominated by mushrooms and salmon. With our new attractive offer everyone will find something for themselves. The menu now includes five new meals. The first one is Norwegian salmon with perfectly seasoned chanterelles, sunken in mozzarella cheese and delicate cream sauce, which adds an exceptional taste to the dish. Fish menu was also enriched with Norwegian salmon with chopped beet and roasted almond flakes, which complete the dish with strong character. Other new meals are available on request, hot and delicate potato pancakes with pieces of Norwegian salmon and mushrooms, and Gnocchi with chanterelles, that is, original Italian dumplings with chanterelles and delicate cream sauce, decorated with fresh parsley. As befits Salmon Festival, also sandwiches are now with Norwegian salmon as a salmon burger, a steak formed from the original Norwegian salmon with fresh salad mix, ripe tomato, onion, sunflower sprouts and lemon mayonnaise in a delicious, fresh baked crunchy roll.